See in Glossary platforms. Use Windows Runtime support to call into both native system Windows Runtime APIs as well as custom .winmd files directly from managed code (scripts and DLLs). See in Glossary, then select the Player category), navigate to the Configuration section, and set the Api Compatibility Level to .NET 4.6 or .NET Standard 2.0. Unity automatically references Windows Runtime APIs (such as Windows.winmd on Universal Windows Platform) when it has Windows Runtime support enabled. To use custom .winmd files, import them (together with any accompanying DLLs) into your Unity project folder. 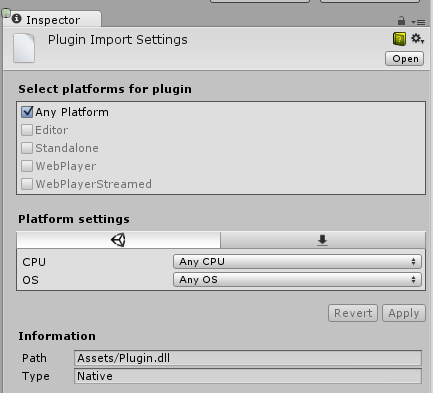 Then use the Plugin Inspector to configure the files for your target platform. See in Glossary you can use the ENABLE_WINMD_SUPPORT #define directive to check that your project has Windows Runtime support enabled. Use this before a call to .winmd Windows APIs or custom .winmd scripts to ensure they can run and to ensure any scripts not relevant to Windows ignore them. Note, this is only supported in C# scripts. See the examples below.